ST. GEORGE – In order to accommodate increasing traffic demand in steadily growing Little Valley region of St. George, a southern section of River Road will soon be getting widened to five lanes. “As the growth of the part of the city … occurring out in the Little Valley area, we’re getting a lot more traffic traveling through this section of roadway,” said St. George Public Works Director Cameron Cutler. 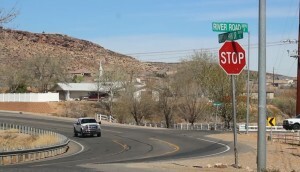 The St. George City Council approved bids related to the River Road Project for around $3.1 million during its council meeting last week. “There will be some very happy people down in the valley,” Councilman Jimmie Hughes said. The plan is to widen River Road to five lanes between 2450 South and Brigham Road. This work will include the replacement of an older portion of the bridge over the Fort Pearce Wash that will be demolished and replaced as the bridge is also widened. A traffic signal will also be installed at the intersection of River Road and Horseman Park Drive. There will be improvements to the pedestrian facility of the roadway, Cutler said. Curb and gutter and sidewalk will be added as a part of the project, and the shoulder will also be widened to around 3 feet or more, he said. Major traffic impacts will likely occur around the work on the bridge, Cutler said. “It will be congested,” he said. Once work begins, motorists on Horseman Park Drive hoping to turn left onto River Road may find it easier to detour over to 2800 South once bridge work begins. Work on the River Road project is anticipated to begin near the end of March and run to late August or early September. “This will help so much,” Mayor Jon Pike said during last week’s City Council meeting. River Road is not the only road project the City of St. George will be engaged in this year. Anticipated to start around May, St. George, in partnership with the Utah Department of Transportation, will begin work on The Mall Drive Underpass. 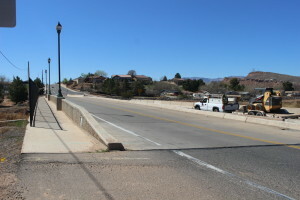 The underpass will go under Interstate 15 and connect Mall Drive to East Red Hills Drive in the area of the Red Cliffs Mall. The project is expected to last until the end of the year.